What items are prohibited at the Ford Center? Video Recorders, Tape Recorders and Digital Cameras with recording capabilities are prohibited any time during an event. The Ford Center reserves the right to examine and prohibit use of any cameras that its personnel deems unacceptable. Any tripod or other photography equipment may not be used or placed in any area of the building without a building issued media credential. For special events including concerts, the camera policies are determined by the show or building tenants. Generally, cameras are not permitted for special events, but please call 812-422-1515 with specific inquiries. Cameras with detachable lenses are not permitted at any time during special events. Banners and signs are permitted providing they are in good taste, as deemed by building management. Signs must not be commercial in nature or utilize wood, metal or other types of objects for support. They must not be hung or fastened anywhere in the building or in any way that obstructs another guest’s view. Cans, glass or plastic beverage containers, squeeze bottles and thermos bottles are not permitted in the Ford Center. No alcoholic beverages may be brought into the arena. Umbrellas of a reasonable size are permitted in the Ford Center. At no time is outside food or beverages allowed to be brought inside the arena. 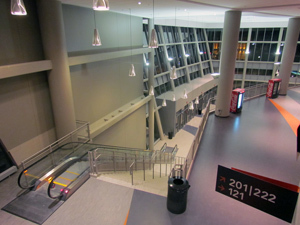 Concession stands are located throughout the arena that sells various types of alcoholic and non-alcoholic beverages. Guests will be required to show proper photo identification and proof of age when purchasing alcoholic beverages. Any other item deemed unacceptable by Ford Center Management. The Ford Center will not store any of the aforementioned items.